Members of the ECS team were recently published in ACM Inroads. 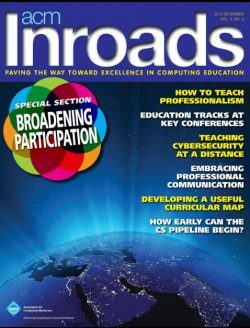 ACM Inroads is a magazine intended for professionals interested in advancing computing education in the world. The article is titled Beyond access: Broadening participation in high school computer science. “Broadening participation” and “equity” are now common parlance among computer science reform educators who are challenging the underrepresentation in computer science. However, what do we all mean by these words and phrases? In this article, we discuss the key theoretical components of our strategy for broadening participation and increasing equity in computer science education. We do so through a description of our goals of our Exploring Computer Science program—a K-12/university collaboration between Los Angeles Unified School District (LAUSD) and the University of California, Los Angeles (UCLA). For us, broadening participation goes beyond issues of access to computer science (CS) learning; we also must transform CS classroom culture and teaching in ways that engage and deepen how diverse students learn. High standards for learning and equity are two foundational elements that must be coupled together. Our mission goes beyond the “pipeline” issue of who ends up majoring in CS in college. Rather, our mission is to democratize CS learning and assure that all students have access to CS knowledge. In today’s world, this knowledge is a critical part of being an educated citizen* and being qualified for 21st century opportunities across a growing number of fields and professions. * In this paper, the term citizen includes undocumented students residing in the United States. Colorlines: Can a Black Girl Be the Next Steve Jobs? Stitching the Loop: E-Textiles unit now available! 2019 marks the release of our new Alternate Unit 6: E-Textiles! Learn more about electronic textiles, our new curriculum, and its supporting resources and materials.